NDN is the name that I have given to this new series of knives. They will all forged from a round bar of 52100. They will be available in hidden tang, integral style knives. They will be offered in blade lengths of 3 inches to 9 inches and of different blade styles. These knives will have the flats left in the “as forged” condition and will be hollow ground blades with the top of the blade slightly beveled. The MINI NDN is another example of the NDN style knives. 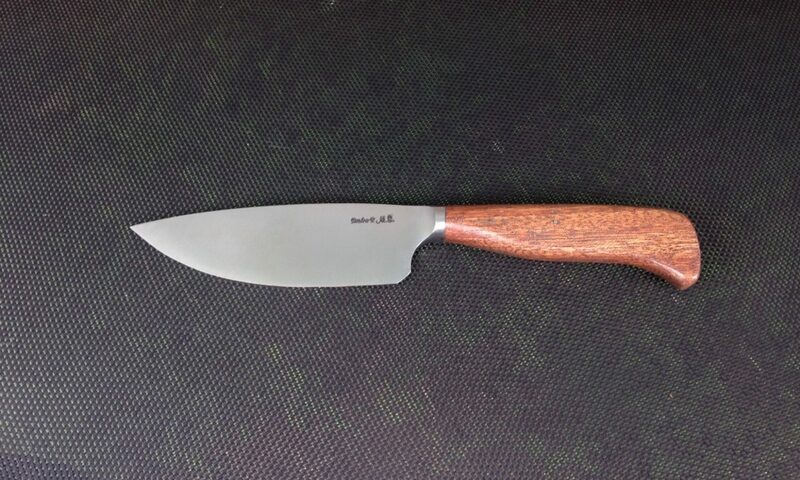 These knives are listed on the available products page. Below is one of the NDN Integral Models. This model has a 6 1/2″ blade of 52100 has a Bois D’Arc handle and comes with custom leather sheath. $410.00 plus shipping. I have used 52100 steels for quite some time and have decided that it is the best I can use. This is the steel that I have used countless times to win and place high in the ABS cutting contests as a 5″ hunter, an 8″ fighter, and several 10″ blades in several states. This steel continues to perform. Thank you for looking at my knives and I appreciate your business.